If you’re shopping for your favorite woodworker or just a general shop rat, we’re here to help. There’s still time this season to get that perfect gift and our Woodworkers Christmas Gift Guide 2017 will help you narrow it down. Starting from least to most expensive, our guide is categorized into price segments. We begin with a $25 section, then move up to the $1,000 range. We may even throw in a bonus “unlimited gift” as well. Just for those that have deeper pockets. Be sure to check out our Christmas Gift Guide for Mechanics as well. No matter how many you purchase and how long you’ve been working with wood, you can Never have enough clamps. These Bessey 8″ KliKlamps are simple to use and work well for light pressure jobs. The magnesium jaw and glass-fiber reinforced body make for a lightweight yet strong clamp. The ratcheting mechanism resists the tendency to vibrate loose when clamping with light pressure. The protective pad can be removed to expose V-grooves for holding round and oddly shaped parts.You can’t beat the price on these. Click here to purchase the Bessey 8″ KliKlamps. FastCap has long been a friend of the woodworker, and they provide the industry with many innovative products. For those pieces that you can’t wait for a typical glue-up dry time, you need the 2P-10 system. 2P-10 adhesive requires the activator and dries in seconds. This allows the user to free up their hands and reduce or eliminate clamps. Specifically, the 2P-10 Jel has a very high viscosity, so it won’t run. The included Caddy keeps your 10-ounce bottle of 2P-10 adhesive and 12-oz. can of activator in one place. Click here to purchase your FastCat 2p-10 Jel Adhesive and Activator. With the RIDGID cordless router, you no longer have to worry about that pesky cord getting in your way as you work your way around the workpiece. This is a great tool for doing a simple roundover, even on larger pieces. In addition, it handles your other router needs as well, such as flush cuts. Our review of the Ryobi Cordless Trim Router. The full kit provides a 1.5 Ah battery and charger with the 18V GEN5X router. A brushless motor, along with the lithium-ion battery provides more run-time and longer motor life. Users can adjust the rpm of the router bit with the easy-access speed dial. The depth of the cut is controlled with toolless clamps built around the body, and it even includes a micro-adjust dial for better precision. There’s even a LED light to illuminate the work surface, so you’re not cutting in the dark. Click here to get the RIDGID 18V GEN5X Cordless Router. This gift choice is something that spans more than just woodworking. Any Pro, DIY, woodworker, metalworker or mechanic would love to have a combo kit like this. The Makita CX200RB sub-compact kits include the 18V drill and impact driver. Basically, you get the size of a 12V tool, with the power and run-time of an 18V. We reviewed this Makita CX200RB 18V LXT Sub-Compact Kit and gave an easy two-thumbs-up (4.4 stars, to be exact). These lightweight, smaller frame cordless tools are much more ergonomic than their full-bodied cousins. Don’t think they’re short on power either. With 350 in-lbs of torque on tap, they have no problem driving larger fasteners, when needed. Give the gift by clicking Makita CX200RB Sub-Compact 18V Kit today. When cutting lengths of lumber, you can’t beat a miter saw. Furthermore, getting into more complex cuts, the need arises for a dual bevel miter. With the Bosch CM10GD 10-inch dual-bevel miter saw, you get the power of a 15 amp motor with a 47° left and 47° right bevel angle range. Even as a 10″ saw, the Bosch CM10GD can cut 4×12 dimensional lumber. A dust collection port allows the user to keep a clean workspace when connected to a vacuum. Furthermore, the 60-tooth 10-inch blade and dust bag is included as well. The Axial-Glide system is more precise than the typical slide rail systems on most sliding miter saws. You won’t be disappointed stepping up to the Bosch CM10GD miter saw. 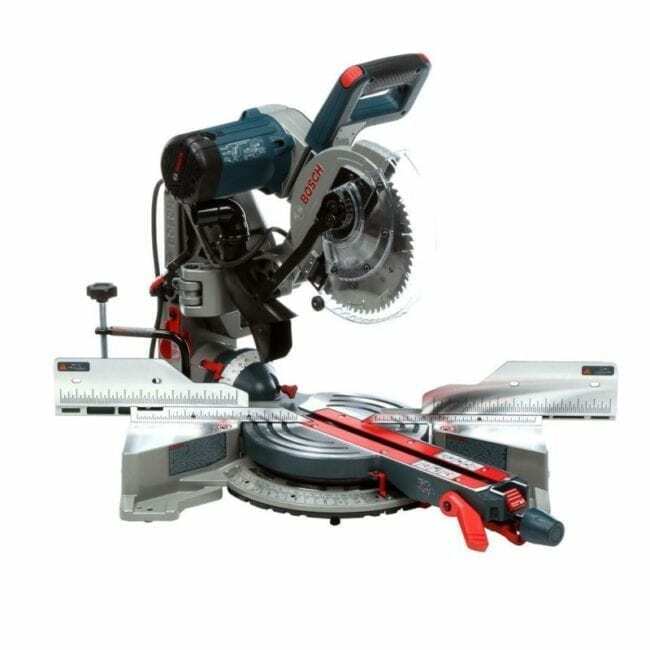 Click the Bosch CM10GD 10-inch Dual-Bevel Glide Miter Saw for purchase. Making the first step to becoming a legit shop is many times upgrading to a more precise table saw. While it’s easy to spend tens of thousands on a saw, the RIKON 10-201 Contractors 10-inch saw is a great option, with value in mind. This is a cast-iron base saw that weighs more than 300-pounds, so it’s not going to move around like a typical 10-inch worktop saw. In addition to the cast-iron base, you also get a magnetic table insert, quick-lock fence and the blade guard with riving knife. The 13 Amp, 1-1/2 HP motor delivers power to the 10-inch blade for the power and precision to make the cut. Maximum depth of cut at 90-degrees is 3-3/8″ and 2-1/4″ at a 45-degree angle. Rip capacity to the right of the blade is 30 inches, and to the left of the blade is a little less, at just 20 inches. RIKON stands behind their contractors saw with a 5-year warranty. Buy now by clicking the RIKON 10-201 Cast Iron 10-inch Table Saw. If you just want to go crazy on buying the ultimate gift for the woodworker, then step right up. Our recommendation is the 25-inch planer from Felder. Our furniture-maker Pro reviewed the Format-4 Exact 63 Thickness Planer and it received almost 5 stars. With a 25-inch width capacity, you can do some serious thicknessing. Be sure to check out the review, and the product speaks for itself. No need to type any further. Click here for more information on the Felder Format-4 Exact 63 Thickness Planer.